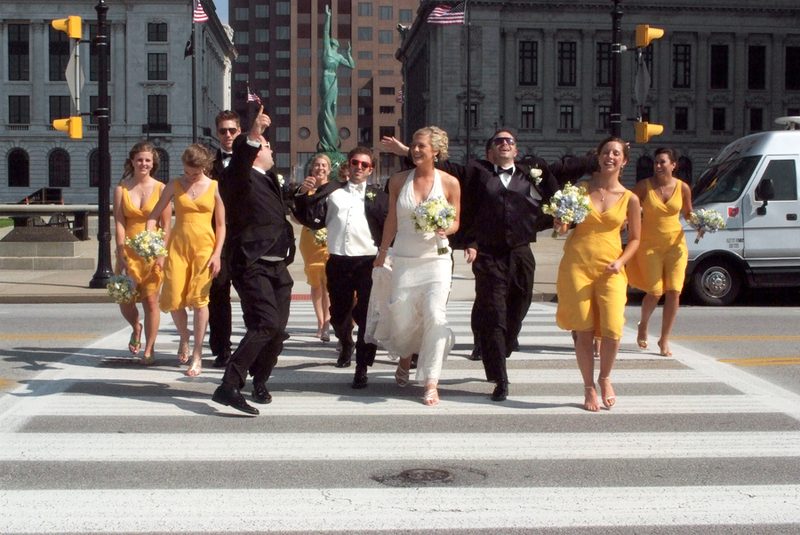 For the contemporary couple whose nuptials are rooted in Cleveland, let the city and surrounding area provide the backdrop for your wedding day photo itinerary. With its modern ambiance and distinctive cultural flair, Cleveland promises an unforgettable photography session to celebrate this memorable day! Begin your wedding day photography session at Edgewater Park on the west side of Cleveland. Overlooking beautiful Lake Erie and embracing the perimeter of the city, Edgewater Park offers priceless vantage points and exciting opportunities for your photography. Have your photographer first arrange several group poses on one of the many fishing piers allowing for a dramatic view of Lake Erie in the background. After finishing with the entire bridal party, capture a few shots of the bride and groom alone before moving on to the Edgewater Yacht Club. Integrate the scenic marina atmosphere and nautical beauty of the docked boats in your photography. Select a few poses of the newlywed couple with boats in the foreground to evoke a feeling of timelessness. Follow this with a shot of the entire group. After the Yacht Club move to the shaded western half of Edgewater Park for a more secluded, private setting. This part of the park is ideal for several solo poses of bride and groom, as the overarching shade of the trees lends a serene, sheltered tone to the wedding day photos and provides a chance for the photographer to capture shots that hint at a more remote, isolated location. If your wedding falls within the popular summer holiday season, make sure to capture a few shots of the fireworks surrounding the fourth of July as Edgewater holds the prime location for an unimpeded view. Fireworks in the background of your photos will simultaneously celebrate independence and your wedding, contributing a dramatic and fun element to your photography. Edgewater Park is the perfect blend of urban industrial and beach environments, capturing two unique aspects of Cleveland’s character. The diversity and cultural ambiance of downtown Cleveland will set the stage for the next phase of your wedding day photography session. Your group will explore the exciting area around the Rock and Roll Hall of Fame, making their first stop at The William H. Mather, a historic tanker ship that has been docked and transformed into a museum. This impressive steel ship provides an exciting contrast between the urban industrial atmosphere of Cleveland and the beauty and refinement of your wedding day attire. Have your photographer arrange several poses of the entire bridal party on the dock with the ship looming in the background, the pristine severity of its colors and size lending drama to your photos. For the couple who desires a more striking background, journey aboard the Mather and take advantage of the height this brings to your photographs. 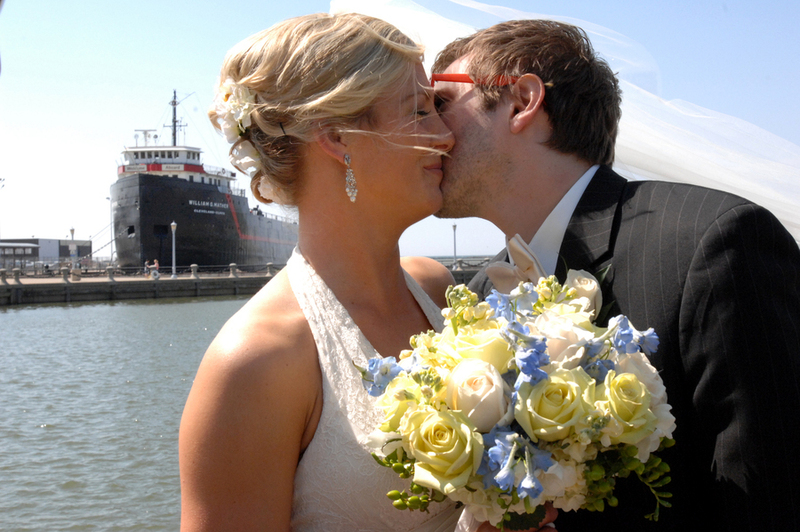 The landscape surrounding the ship is classically distinctive of Cleveland’s urban atmosphere; arrange a few shots of the bride and groom alone with this landscape as the backdrop before bringing the wedding party in for an entire group shot. Only steps from the William H. Mather is your next stop along your wedding day photo itinerary. The Cleveland Browns Stadium is a must for the sports enthusiast couple and committed local sports fans. Located in the midst of Cleveland’s vibrant downtown, the Browns Stadium is framed by the vintage urban landscape of East 4th Street and the emerging art scene of the entertainment district. Bring your photography and wedding party to the front of the stadium and arrange your first shot so that the distinctive stadium entrance is the backdrop. After several poses with the entire party, have your photographer capture a few shots of the bride and groom alone on the awning covered steps leading to the main entrance. The oversized Cleveland Browns insignia above provides an interesting photo angle as your photographer focuses on the couple yet strives to include the iconic title above. Bring the bridal party back into the picture for the remaining shots, taking advantage of the thrill and fun of the Browns to make these concluding pictures full of whimsy and excitement. Use this time to capture a few less serious poses, letting the spirit of sports infuse your wedding day photos. For a less definitively urban atmosphere, journey beyond the immediate limits of Cleveland to Chagrin Falls, a picturesque village with abundant opportunities for idyllic photo shots. Evoking a time gone by, Chagrin Falls provides a sense of nostalgia and serenity that only the past can convey. For spring weddings, capitalize on the thousands of blossoms dotting trees and bushes throughout this little town. Stone walkways along the river offer natural stopping points for group photos. 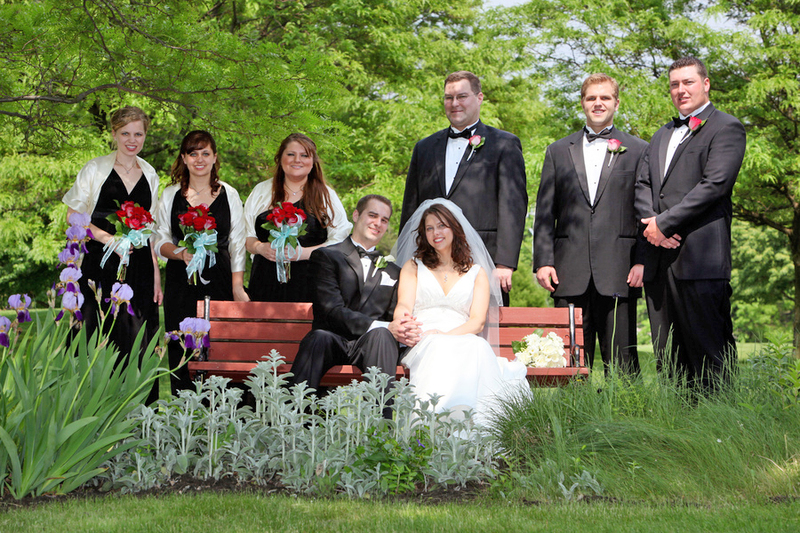 Have your photographer arrange several poses with the wedding party in foreground and one of many waterfalls beyond. Continue further along the walkway to capture your final solo shots of bride and groom. Enhance the historic ambiance of your photography by arranging poses with both falls and classic brick architecture in the background.